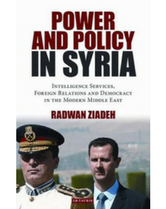 Bio: Radwan Ziadeh is a Fellow at the Institute for Social Policy and Understanding (ISPU), a Senior Fellow at the United States Institute for Peace, and a Dubai Initiative associate at the John F.Kennedy School of Government at Harvard University. He was most recently a visiting scholar at The Institute for Middle East Studies (IMES) at Elliot School of International Affairs at George Washington University, Prins Global Fellow at Hagop Kevorkian Center for Near Eastern Studies at New York University and Visiting Scholar at The Center for Contemporary Arab Studies (CCAS) at Georgetown University. Previously he was a Reagan–Fascell Fellow at National Endowment for Democracy (NED)and Visiting Scholar at the Center for the Study of Human Rights at Columbia University. He was also a Visiting Fellow at Chatham House (The Royal Institute of International Affairs) in London and a visiting scholar at Carr Center for Human Rights at Harvard University (2008–2009). He is the founder and director of the Damascus Center for Human Rights Studies in Syria and co-founder and executive director of the Syrian Center for Political and Strategic Studies in Washington, D.C. He is the managing editor of the Transitional Justice in the Arab World Project. 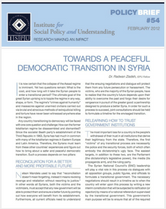 Ziadeh was previously the editor-in- chief of Tyarat magazine in 2001–2002 and secretary of the Syrian Organization for Transparency. 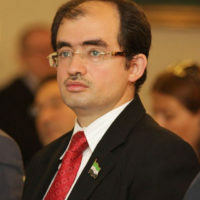 He was a researcher with the UNDP’s &quot;Syria 2025&quot; project and was named best political scientist researcher in the Arab world by Jordan’s Abdulhameed Shoman Foundation in 2004; in 2009 he was awarded the Middle East Studies Association (MESA) Academic Freedom award in Boston; and in 2010 he was awarded the Democracy Courage Tributes award on behave of the Human Rights movement in Syria by the World Movement for Democracy at Jakarta- Indonesia. He is on the board of directors for the Center for the Study of Islam and Democracy ( CSID) in Washington, D.C., and a member of the Advisory Group for the Institute for Democracy and Electoral Assistance (IDEA) in Stockholm, Sweden. In addition, he is a member of the Advisory Board for the Islamic World Initiative at USIP for “Reform and Security in the Muslim World” program, a member of the Middle East Studies Association (MESA), the American Political Science Association (APSA), The International Institute for Strategic Studies (IISS) in London, the International Political Science Association (IPSA), and the International Studies Association (ISA). 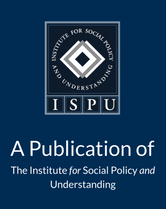 The West can no longer afford to give the Assad regime impunity. Airstrikes and a no-flight zone should begin at once.